We’ve had a great weekend filled with fun, sun and lots of laughs. We kicked off the weekend by seeing Book of Moron, a Broadway musical by the writers of South Park. It was well-done and kept us laughing the whole time! 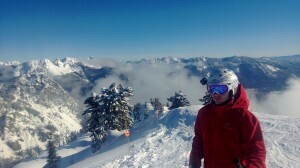 Saturday we relaxed at home in the morning and headed up to Alpental for some mid-day skiing. 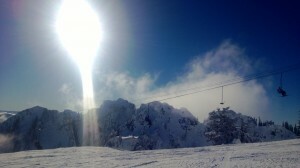 We met up with Patrick, Carrie and Emily and enjoyed a bluebird day. Alex brought his Contour camera (it’s a small, portable video camera that mounts to his helmet so he can record his ski day), so we’ll plug it in today and see if we got any good footage. The video always looks better when the skies are clear, which is a rarity for us here in Washington. Alex is becoming quite the speed demon on the mountain – Patrick better watch out!! Today we’ll just get some stuff done around the house. With all that has happened in the last week or so we have put our to do list to the back burner, so we’ll just do some catching up today. It’s been a VERY chilly week here in Seattle – normally the temperature is 45 +/- about 3 degrees, but it’s gotten below freezing here most days in the last week. We aren’t used to scraping our cars, straying away from the usual fleece jacket, or cranking up the heat so much! 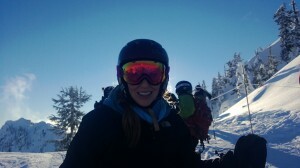 This entry was posted in Friends, Fun, Life, Skiing and tagged bluebird day, skiing on January 13, 2013 by Alison Allen.